Hello! First of all, I'd like to say a big thank you to everyone who has commented or sent emails to me regarding my Taylored Expressions Guest Designer news. I truly appreciate all of your well wishes! It's time for a brand new Mojo Monday sketch (#230). It's Round or Square week! I was in need of a card for a dear friend who recently lost her father. No words can adequately express our deepest sympathy, but hopefully this card will help to bring some comfort to her and her family. I used Forever in Our Hearts. Accessories: A Cut Above Dies: Rounded Scallop Frame Die (Verve), Big Scalloped Borderabilities Petite (Spellbinders), Ribbon, Twine (May Arts), Button, Pearl flourish (Zva Creative), Flatback pearls (Pizzazz Aplenty), Foam tape, Thread, Sewing machine. look at THIS beauty! looove it. that ribbon is gorgeous. GORGEOUS Steph! I LOVE this! Wonderful card. So elegant and beautiful! Another stunning card Stephanie! 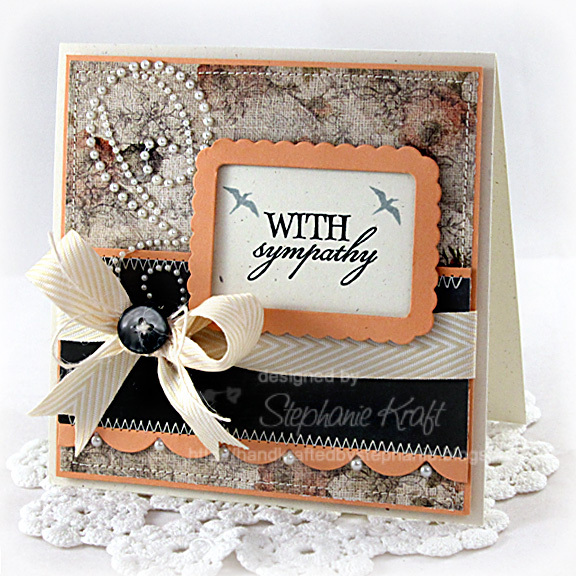 This Sympathy card is quite elegant and will surely bring comfort to a loved one. Love your perfectly tied bow!